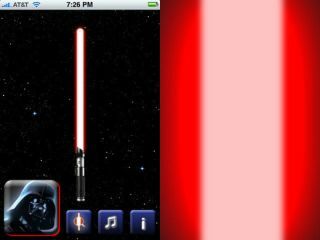 Lightsaber App returns to the iPhone! The new App... you can even go fullscreen! We all wept and lamented when the Phonesaber App disappeared thanks to stupid 'copyright issues' from THQ. Well, the good news is that its maker, TheMacBox, has finally released an official version, having teamed up with the Star Wars lot to add in some bells and whistles too, as was revealed by Arstechnica. However, there has been some criticism (from places like Macenstein for instance) that the new product is 'over-branded'. Things like having to say no to buying the game each time the App starts, or a long boot up time, clearly irk those who enjoyed making swooshy sounds with their handset. The choice of five colours now comes with a choice of five characters to 'wield' them now as well... except three of those colours are red. But there's some Star Wars music to keep you going, and best of all it's FREE! So not all bad really. Apparently, it's only available as an update to the Phonesaber App at the moment... though it will be hitting the AppStore soon.